Book #2 for Sophie's Book Club was a collection of essays by the wonderful lady I have a bit of a blogger girl crush on. Yes there are a few people who fit this bill but today I am referring to the one and only Emma Gannon, author of the blog Girl Lost In The City. As well as running a rather radtastic, inspiring blog, she also has a podcast under the same name as her book and contributes writing to many other places on and offline such as; Teen Vogue, The Sunday Times magazine, The Guardian and many others. She is a boss basically. When I heard she was releasing a book I swiftly pre-ordered it and was so pleased that people voted for it in my book club's polls. So what did I think? Well in one sentence: I loved it. End of review. I jest, keep reading if you want the full details. Ctrl Alt; Delete is a series of essays about Emma's experiences and learnings growing up online. She was born in the year the Internet came to fruition so she literally grew up alongside the Internet. Every social media platform you can think of; LiveJournal, MySpace, Bebo, you name it, she was on there. As well as her early learnings on discovering the expanse that is the Web, she also details her experiences of relationships and how they are shaped/misconstrued by the Internet, how it has helped her forge a career path, the power of deceptive photography and more. It might only be 258 pages but there is a lot of ground covered here. A lot of the material in this book stood out to me, especially Emma's writing on blogging. "The reason my blog makes me so happy, when it comes down to it, is the freedom it brings me...I can always mentally escape on my blog even if I can't physically. Diving into my blog often feels like the bit in Mary Poppins where Bert and the kids all jump into the street painting, holding umbrellas in the rain...eating toffee apples and loving life." This idea really resonated with me, the creative control my blog gives me, this corner of the Internet that is all mine, makes me so happy. I don't think non-Internet people will really grasp that idea but it honestly does. The escapism it provides as well is also so satisfying. The recognition as well, which she talks about, no matter how big or small is also amazing. I still get such a buzz when somebody tells me they've read something I wrote and like it, or just that they love my blog. That's probably my inner peacock coming out but us creative folk love praise. Emma's writing on the MSN years was also uber relatable too. I cringed as much as I laughed and sympathised with her tales. While MSN certainly had some downsides, I experienced some rather nasty bullying on it through a couple of group chats, I also made some of my closest friends through hour-long MSN conversations. Social media is such a double-edged sword like that isn't it? 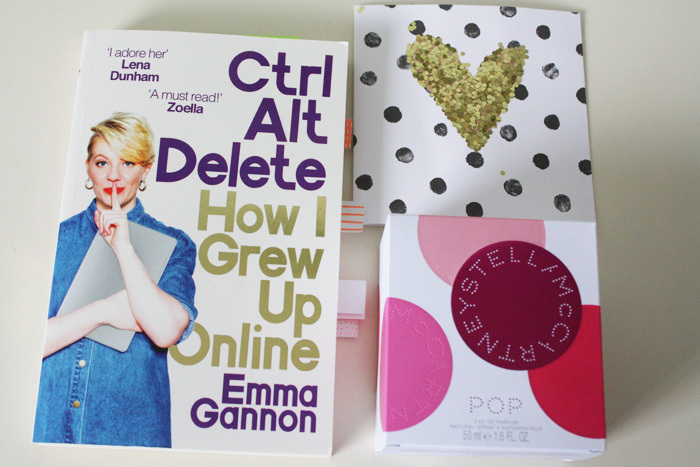 Ctrl Alt; Delete is a book every millennial and Internet loving person needs to read. Even if you're not a big Internet person you still need to read it. Scratch that, everybody needs to read this book. It's so relatable, laugh-out-loud funny and also incredibly inspiring and thought provoking. Emma is such a gifted writer and this book was such a strong debut. I can't wait to see what she does next. I gave this 4/5 stars over on Goodreads for anyone wondering, but I may have to go back and amend my review to make it 5 stars. I loved this book that much. If you're wondering what the next few months of Sophie's book club are looking like, for September we will be reading The Lonely City by Olivia Laing. This book has been getting some promising reviews, and if this is anything to go by we are in for a treat. October sees two books up for the reading. By no means do you have to read both of them. I just wanted to introduce a book to sit alongside the collections of essays by Mara Wilson, entitled Where am I Now? . The second book for October is Milk and Honey by Rupi Kaur. It's another book I have only heard positive things about and I am looking forward to reading Kaur's poetry. -Have you read Ctrl Alt; Delete? What did you think of it?